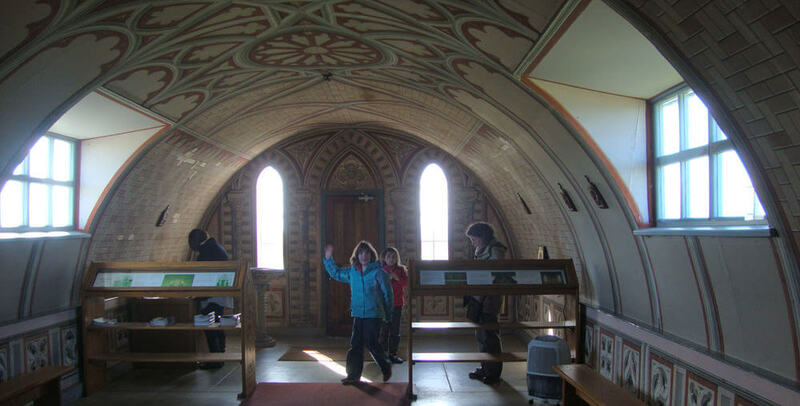 We travelled to the Northern Isles with our two girls (aged 8 and 10) during Easter 2010. My husband was in Scotland by car on business and the girls and I joined him at Inverness airport . We travelled for a couple of hours north and stayed the first night at Helmsdale Independent Hostel, set in a scenic coastal village. We had a family room to ourselves and during the evening we joined a group of cyclists in the warm lounge who were on the last night of a Lands End to John O’Groats cycle ride. It took a couple of hours the next morning to drive to the Ferry port by Thurso. There are two vehicle ferries to Orkney, the main one to Stromness, and a slightly cheaper one to St Margaret’s Hope. We had booked on the cheaper one, and found we were the only car on-board among a sea of lorries. We enjoyed the trip, which is shorter then the main route, and were delighted to spot puffins floating around on the water. From St Margaret’s Hope it was a scenic drive through South Ronaldsay Island to mainland Orkney. These Islands are linked by barriers (causeways carrying roads) which were built in WWII by Italian prisoners of war. The children enjoyed driving across the barriers with sea on both sides. We stopped at a quaint decorated church built by the Italian POW and then stopped again at one of the many gorgeous white beaches for a picnic lunch. Later on in our holiday we often spotted seals on similar beaches. An Orkney church built by POW on the Northern Isles. Our first night’s accommodation was at BROWNS HOSTEL AND HOUSES in Stromness and we surprised our host by arriving at an usual time. The main ferry from Scotland arrives direct into Stromness and Mrs Brown, a brilliant host, sets her welcoming times by the ferry schedule. Whatever route you arrive in Northern IslesI would recommend a night at Stromness. It is a sleepy town, with narrow paved streets to wonder around. Once the most important town on Orkney but now playing second fiddle to busy Kirkwall. 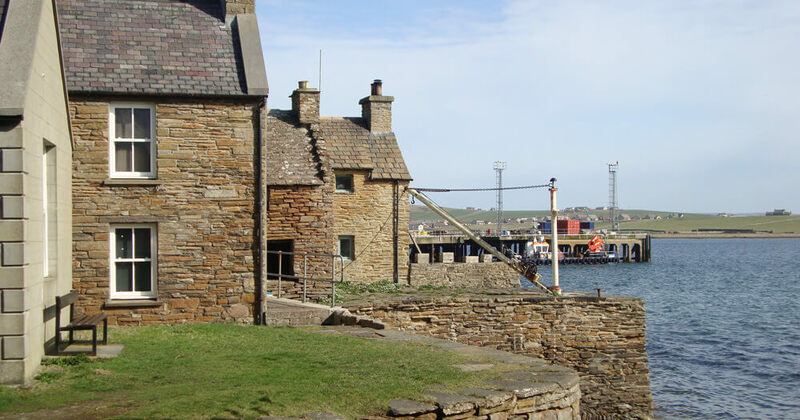 There is a superb museum in Stromness which is worth several hours, as it gives you a feel for how Orkney was a jumping off point to Canada and explorations north. It made me realize that Orkney is not the top of the UK as I thought from down in Derbyshire, but the middle of Britain, Shetland, Norway and Iceland. Browns Hostel and Houses is a small cosmopolitan hostel in central Stronmess. We stayed in the house over the road from the main hostel and found we enjoyed the atmosphere of the hostel in the early evening and the peace of the house when it was the girl’s bed time. Another hostel in Stromness is HAMNAVOE HOSTEL. There are famous Neolithic remains on Orkney Mainland, the Ring of Brodgar, the Maeshowe Passage grave and the Standing Stones of Stenness. These ancient monuments are in really atmospheric settings. Skarra Brae (a prehistoric village)is worth having a look around and I strongly recommend the quirky house next door, which was lived in by the chap who discovered the ruins. The girls were getting bored of old monuments by this time and the lady attendant at this house indulged them in a bit of sheep hide and seek which they loved. My next bit of advice is the best bit of this blog! Once you have got to Orkney mainland take one step beyond and visit one of the smaller Northern Isles. Orkney mainland has the feel of a central hub and it is only when you get on a ferry once more that you get that real island feeling. The ferries all leave from Kirkwall served well by Kirkwell Peedie Hostel and Orcades hostel. I would recommend a trip to Chalmersquoy Barn on Westray, OBSERVATORY HOSTEL in North Ronaldsay or Ayres Rock Hostel on Sanday. Leave your car in Kirkwall (if you have one) and stay for a good few nights on one of these northerly Islands. You can hire bikes to explore the islands, the roads are quiet and the distances short, or just be still and enjoy the local community. If you are planning a holiday around the Northern Isles a great place to start is this map of hostels on Orkney and the Northern Isles. If you stay few nights on one of the Northern Isles you will have a good chance of seeing the Northern Lights. Lancaster University provide a fabulous service called Aurorawatch which you an sign up for on their website. The service will text or email you when the Aurora Borealis is at it strongest. Its well worth signing up to so you don’t sleep through “The Merry Dancers” like we did. Our family had traveled far enough North to experience the Northern Lights (if only in our dreams), we had enjoyed two ferry journeys and some lovely moments.